It's time for more of April's favorite things. This week, I'd like to highlight the love of my skin's life: the famous Whipped Body Creme. If you are fortunate enough to receive Christmas presents from me, you'll be very familiar with this magical potion. It's not made from unicorn kisses, although it seems like it would be, but of fair trade shea and cocoa butters, organic sweet almond and apricot kernel oils, aloe, and a proprietary herbal tisane, (which might actually be unicorn kisses). I use this everywhere--my body, my face, sometimes my hair. I've got oily skin, but this sinks in so quickly that I never feel like I've got an oil slick in my face. There's no scent, so I give it to my extremely sensitive mom every year, and there's no artificial anything so people with the most temperamental skin can use it daily. I'll sometimes add patchouli (of course) oil to it so I can smell extra amazing throughout the day. But adding anything is unnecessary. It is practically perfect in every way. I've been around Strawberry Hedgehog for a long, long time. Having known Tracy for what seems like forever... 1999ish... I've been privileged with watching SBHH grow from a tiny, baby seedling of an idea in 2003 to the magical soapy heaven on earth that it is today. I love everything in the shop -- no lie. That being said, I am full of opinions and I have my favorites. Let's go through them for the next few weeks, shall we? This week I want to talk about the Sandalwood Patchouli soap. I'm not going to apologize for it; I am an unabashed lover of all things patchouli. From the moment I bought my first vial of Spiritual Sky Patchouly at Bebop Records, (spoiler: it's not as great as you remember), I've been in love. Needless to say, my taste in patchouli has become more sophisticated over time, but I'll always remember that first patchouli with much fondness. That being said, the SBHH patchouli is top notch. I'm spoiled by it. The thing I love most about this particular iteration of patchouli is the depth given to it by the addition of smooth sandalwood, woody Virginian cedar, amber-like labdanum and sweet benzoin. Patchouli is already deep, but it's got a greenness to it that sandalwood does not possess. Sandalwood is earthier, darker, and along with its woody kin-oils, it compliments the patchouli very well. It's basically like bathing in temple incense every morning, which is an image I personally cannot get enough of. There's a reason it's a staple at the shop, and why you owe it to yourself to at least try it. Next week: Lavender Tea Tree Facial Moisturizer. Irritated skin begone! A few weeks ago, I had the privilege of attending a wonderful workshop led by my friend Michelle, of Between Heaven and Earth Aromatherapy, at Uprooted Bloom Room in Scottsdale. It was such a relaxing, positive experience. Michelle is so knowledgeable and such a fantastic teacher. I loved the loads of mind-blowing information that she presented in an easy, comprehensive way. It wasn't overwhelming--it was fascinating. There was so much hands on experience as well, I feel like I've retained the info. (Well, I also kept my notes.) I'm excited to attend another workshop at the Strawberry Hedgehog boutique this Thursday, 8/17. 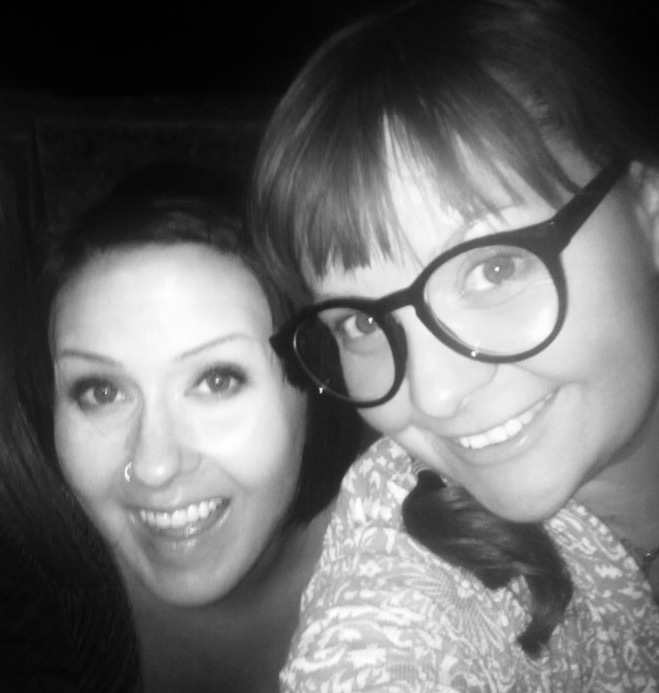 We made two custom blends -- an inhaler and a roll on scent -- both of which live in my purse. Really understanding the different properties and intentions of each oil helps you create things of beauty you will use and that will benefit you, and I'm so grateful to Michelle for deepening my knowledge on this. I feel that it is similar to cooking in that you have to know the food you're working with to know what will work well together. Michelle is like a master chef, and her knowledge is invaluable. Put your sliced cabbage in a bowl and drizzle with apple cider vinegar and toss with salt and pepper. Add all other ingredients to your blender and pulse until chopped but not totally smooth. Pile your chickpea salad high on your cabbage and top with cranberries. This would lend itself perfectly to a jar salad on the go as the cabbage won't get soggy or squished and will just taste better sitting in some salt and vinegar 👅 This meal was inspired by Clean Food, Dirty Girl. I am currently obsessed with the ease of eating well and enjoying cooking again now that it is all a no-brainer (recipes, grocery list, and batch cooking methods provided weekly! 😱👌). I love the generous parsley in this. This easily dismissed Herb is a power house for UTI's, kidney stones, edema/limb swelling, cystitis/bladder inflammation, heart disease and cancer prevention! I love love love recipes that emphasize this brilliant,simply delicious green! I added extra because I always need more.. who wouldn't?? The other star of this show is the red cabbage! Tasty and crunchy, of course, but packed with nutrients like cancer fighting Polyphenols, vitamins A and C, essential for immunity and vitamin K, important for bones, along with minerals potassium helping with blood pressure and regulating heart beat and trace mineral manganese, important to convert carbohydrates, fats and proteins into usable energy for cells. Today's the big day! we are raising funds for Ironwood Pig Sanctuary outside Tucson from 11am-7pm at the Soap Shop & Vegan Boutique at 1501 W Thomas Rd, Phoenix! We have generous donations from 24 Carrots, Nami, Treehouse Bakery, Positively Frosted, Fluffy Vegans, GNOMIES Zoe and Sheena, myself, Tracy, and other amazing local animal loving baking enthusiasts! We have been doing these for years, our first one 7 years ago now! Oh how the time flies. Can't wait to see you today! Thanks! Our first World Wide Vegan Bake Sale in April 2010 at Coffee, Cookies and Crafts! The second vegan bake sale we participated in is where I met Zoe! 💖 Again, back in 2010. I'm delighted to be having some guests from Whole Foods for a tour of the factory today so I'm making them some extra special treats for getting up early and trekking to downtown Phoenix on their time off. 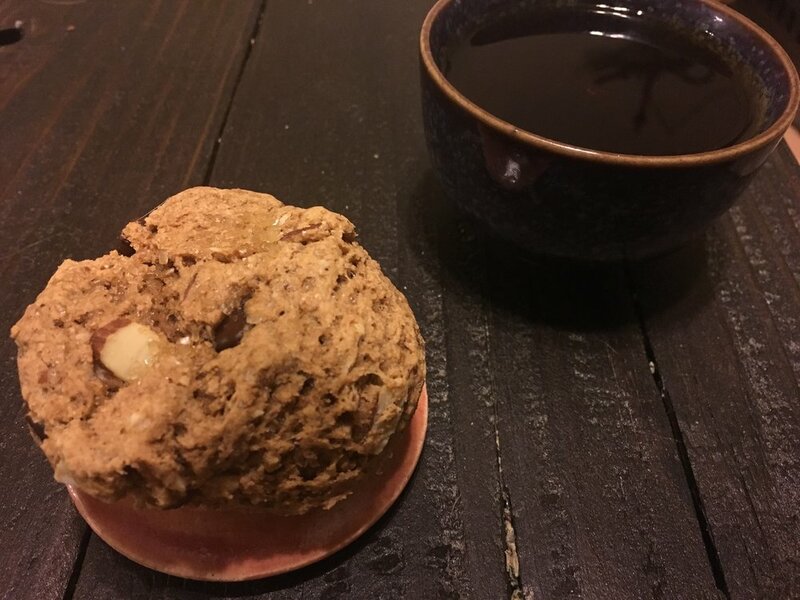 Jamocha-Almond Scones! Get a pan greased or papered and set oven to 400 degrees. Get your almond milk with vinegar started and let it sit while you work on the dry stuff. Whisk together the dry ingredients in a large mixing bowl. In a small mixing bowl add the soy yogurt to your vinegar milk, oil and stir in your coffee crystals until mixed. Add wet ingredients to the dry, folding them in gently not to over mix. Once combined (it will look crumbly but you shouldn't see flour) fold in chocolate chips and almonds. Scoop and drop quarter cups of your dough onto your cookie sheet, sprinkle with a pinch of sugar and give them a gentle squish. Bake for 12-15 minutes. Let these cool a bit before devouring. My quality control taste test was with a cup of cardamom black tea and it was divine! 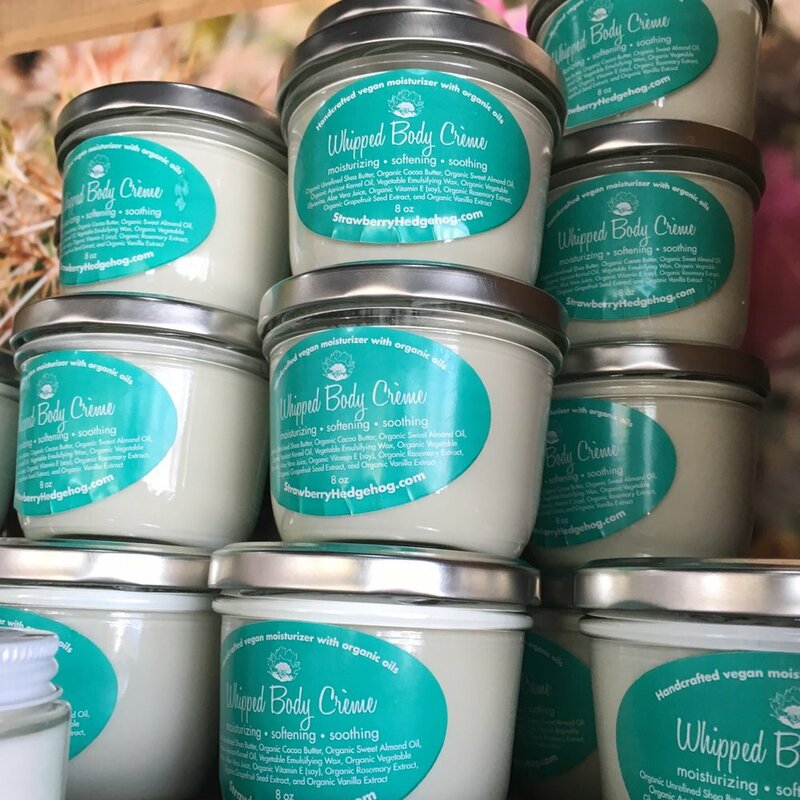 Come by the Soap Shop & Vegan Boutique on Friday, Nov 25 between 11am-7pm for great deals and amazing products at 1501 W Thomas Rd, Phoenix, or come find us at Cityscape in downtown Phoenix from 10-5pm. This Black Friday, avoid the madness and sleep in but still get cool stuff when you shop at Alternative Black Friday Vintage Market brought to you by Valley Vintage at CityScape Phoenix. Over 30 local, vintage and handmade vendors will be set up in the heart of downtown Phoenix for this one-of-a-kind event that drew over 4,000 shoppers last year. In addition to these vendors, CityScape tenants, including Urban Outfitters, Charming Charlie, Jos. A Bank and more, will also be offering Black Friday deals. Shoppers are also encouraged to dine at a number CityScape’s amazing restaurant options including brunch at Blue Hound Kitchen & Cocktails, The Corner, Fractured Prune Doughnuts, Grabbagreen and The Breakfast Club. For more information, call 602-772-3901 or visit, http://www.phxicerink.com/abf/. "Phoenix Flea is a Modern Market for Handcrafted, Vintage, Fine Art, Fashion, Artisan Food, & More! The next Phoenix Flea is on Small Business Saturday, November 26th from 10am-5pm at Heritage Square Park in downtown Phoenix! This fall will be our biggest market yet! We will have over 100 local craftsman, artists, designers, & curators + food trucks! Plus Heritage Square is home to the Rosson House Museum (additional charge for tour) and Pizzeria Bianco, Bar Bianco, The Rose & Crown Pub, Nobuo House, & Royal Coffee. Buy tickets in advance to skip the long line and get into the market quicker or purchase tickets at the gate for $5 cash. A portion of proceeds are donated to a local nonprofit. Go to www.phx-flea.com for tickets and additional information"
Banana bread is a no-brainer for veganizing as eggs are easily substituted with mashed bananas. This is an easy recipe that can be tweaked by changing up the spices, it is dense and moist, lovely on its own, and delightful with black tea in the AM or as a snack! Preheat your oven to 350 degrees. Prepare your loaf pan by greasing or lining with parchment paper (I greased with a light layer of veganaise out of desperation -- out of oil and earth balance, the shame! -- it was undetectable and the bread came right out). Mash your bananas in a medium bowl, add your sugar and liquids. In a small bowl whisk together your dry ingredients then pour them into your wet, stirring until combined then fold in your walnuts and chocolate. Pour into your loaf pan, sprinkle with sugar and bake for 1 hour 15 minutes. Allow to cool for a bit then devour! Super easy on the go breakfast! We are so thrilled with our new space and hope you will stop by to see us at 1501 W Thomas Rd, Phoenix, 85015, on Fridays, Saturdays, and Sundays from 11AM-7PM. Thanks!! We will reopen at our beautiful new location in mid-August. We are getting set up just down the street at 1501 W Thomas Rd, Phx, across from Phoenix College and Encanto. Please hit up Summerwinds on Bethany Home, all AZ Whole Foods and Phoenix Public Market Shop for your soapy fix until then. Thanks so much for your support! Today is our last day at the Saturday Soap Shop! Come stock up, save big, and say bye between 11am-7pm (or while supplies last!) at 1415 W Indian School Rd, Phoenix, enter/park in back. Smoothies are such a fantastic way to get the vitamins, minerals, and fiber from lots of fruit without eating it straight up. Even pure fruit juice on its own can be a massive straight shot of sugar to your system, have you ever felt a crazy rush after some really good juice? I remember the first fresh carrot-apple juice I had, years ago. I grabbed it as a healthy breakfast before running to class. It was like a cup of delicious candy and I immediately felt like I'd had a cup of the best coffee ever.. so alert! so energized! OMG what is this magical liquid that has given me super human strength?!.... Unfortunately for me, it was followed by a terrible crash. I was shocked! Yes, it is packed with great things for you like you've just had an entire bunch of carrots and a couple apples but all that sugar in your system is hard on your liver and without the fiber from the plant it is a jolt that is harder to process and can cause spikes and crashes in blood sugar and mood swings. The fiber from your smoothies helps soften that delicious sugary blow. What's even better than a smoothie? A smoothie popsicle! I found some really affordable popsicle molds at IKEA and decided high summer temperatures call for some popsicles on hand. They are tasty and nutritious and make a great snack. * You could use any fruit you like, fresh or frozen, but the bananas really lend the sweetness you're looking for from a popsicle, ripe is best. Frozen mangos in place of strawberries will give you a creamier bar or add a drop of vanilla and omit strawberries for an orange-julius bar. Sub a strong batch of your favorite herbal tea for some of the OJ or almond milk for added herbal goodness. Blend all ingredients together then pour into your popsicle molds. Allow to freeze solid, gently remove from mold (running the outer plastic part under warm water helps release it), and enjoy! My Mom loves to bring me veggies when she visits lately, a super treat for me as I am a chronic eater-outer and have a Bachelor's fridge, most days. On her latest visit, among the variety she brought cauliflower, my least favorite veg. It has been 20+ years of living the veg-life so I do adore most veggies, and when done right cauliflower is on that list, I just rarely give it a shot. There is a tahini cauliflower dish at Pita Jungle that I adore though so that was the inspiration today. ** BONUS: a head of cauliflower has 11g of protein (The same amount as half a can of chickpeas) , loads of vitamin C, a good amount of vitamin B-6, along with some good iron, calcium, magnesium, only 145 calories and 12g fiber! PLUS cauliflower is rich in DIM, a phytonutrient that has been show to help fight cancer and balance hormones. heat up your indoor grill (go get one, seriously, your tofu and veggies will be off the charts) for a few minutes then place the cauliflower pieces on the grill, squeeze half of your lime juice on the florets, close 'er up and wait. I grilled mine for about 10 minutes, you want the texture to be soft and a bit of charring. While waiting for the grill, whip up your sauce in a medium sized bowl. Just stir together the tahini, remaining lime juice, paprika, garlic, and salt to taste. Spoon the cooked cauliflower into the bowl and toss in sauce, eat it up, yum! Big changes are on the horizon for us at Strawberry Hedgehog! We've had a wonderful influx of new wholesale customers, we've had unpresidented success at the Saturday Soap Shop, sales at Arizona Whole Foods are booming and we are feeling pretty great about our hard work paying off and our awesome products being so well received. THANK YOU!! New Packaging! We are working on some fabulous new packaging, thanks to the wonderful artistry of Stacey Newlon (you may also know her as a dedicated animal activist around Phoenix, one of our beautiful Soap Gnomes, the artist of the hedgehog mural at the Soap Shop, or her teaching at Pinot's Palette in Paradise Valley!) I can't wait to show them off but had to put a teaser here to pique your curiosity and let you know to be on the look out for our new look! New Location! We are also moving this summer! That's right, two years at our first official Soap Shop and we have already outgrown it! Keep your eyes and ears open to see where we have landed. We have had some ups and downs searching for the perfect spot but we have found it in an unexpected spot, very close to home but in an easier to access, larger, and what will be a bit fancier space! I can't wait for the big reveal but for now.. just know we are in-flux and please be patient with us. Be sure you follow us on instagram for daily updates and inspiration or facebook for less frequent but equally great news. All through June we will have great deals to clear out product at the Soap Shop so be sure you're stopping by every Saturday to stock up on something new! Thanks for all of your help making so much great change happen. We couldn't do what we love without you! The lavender bushes in my back yard are my absolute pride and joy. They are bursting with color and magnificent scent and is a favorite treat for the neighborhood bees. Of all of the many herbs, fruits, and flowers that I work with lavender is by far my favorite. Why, you ask? As if its beautiful spears of tiny purple blossoms were not enough, it is by far the most versatile as far as aromatherapy and general use is concerned. 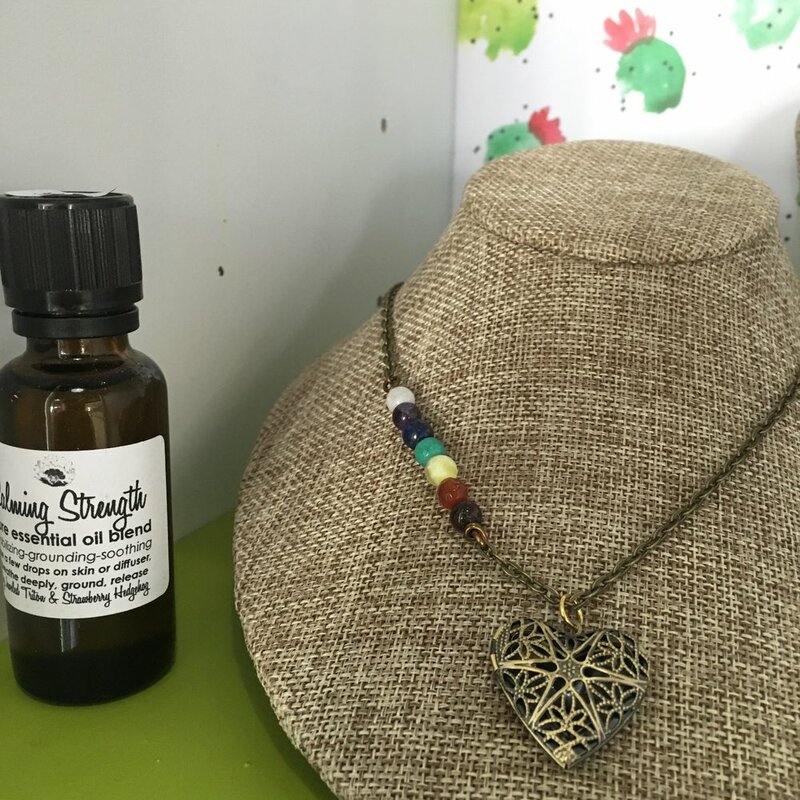 It is my most popular scent for all of my body products I've made throughout the year from handmade soaps and hydrating mists to scrubs to bath salts. Lavender is the essential oil I most often diffuse in my own home for relaxing and soothing aromatherapy. Lastly, lavender is a fabulous ingredient that stumps even the best foodie when cooking for that little something extra to set your goodies leaps and bounds beyond the rest. Lavender, a cousin of the mint plant, has been used and highly valued for centuries as a balancing, soothing, relaxing perfume, for its antiseptic and sleep-inducing properties. It is known that it was used in ancient Egyptian perfumes and the dried buds were scattered across midevil castles as a deodorizer and disinfectant. During the time of the great plague in Europe lavender oil was used to ward off the plague which may have actually helped as lavender has bug-repellent properties so it could have kept away the fleas that spread the bubonic plague. Lavender's rich history sets it apart from other flowers, as does its unique scent being a flower with an herbaceous scent and having the ability to both relax and gently stimulate. It is used today in fancy French cuisine and at the finest spas. While I am neither fancy nor French I can share with you the recipes I have come up with through much trial and error that incorporate this amazing flower. It brings a soothing quality to whatever you use it in, I hope you will give it a try! Add 1 part lavender buds to every 5 parts black or green loose leaf tea. Pour boiling distilled water over your blend and cover, let steep for 3-5 minutes and strain. For hot tea just pour into a teacup and enjoy! *For an added burst of lavender add a drop of lavender essential oil to the leaves (not to your already brewed tea! Never add essential oils directly to a water based liquid as it will never mix and can cause damage to mucus membranes -- your throat, your esophagus, your tummy lining -- I know some eo companies advocate this but they are wrong. period. ), this is also delicious when blended with 1 part mint leaves or 1 part rose petals for every part lavender buds. Yum! Where can you find dried lavender buds? Check out the bulk herb section at your local grocery store. I know they are sold in the bulk section at my local Whole Foods as well as my local Sprouts Market. Locally in the Phoenix area I would recommend Loose Leaf Tea in Phoenix and Ahwatukee, Tangled Roots Botanicals in Glendale, and Desert Sage in Chandler. You may be wondering "What are those amazing looking cookies with the iced tea??" Those are my super secret recipe that I am disclosing just for you! They have been a huge hit at every pot luck I've ever been to and every party I've ever had. Perfect for every occasion, they are my vegan aromatherapy cookies - Lavender Lemon Sugar Cookies. If you have tried my cookies or decide to make them let me know what you think! 1. Whisk together dry ingredients (flour, salt, baking powder, and lavender buds) in a medium bowl. 3. Mix your egg replacer and set aside - do not make too early or it will not be as effective. 4. With food processor or mixer running add the dry ingredients a cup at a time and mix until well incorporated. 5. With the mixer running add the vanilla extract, egg replacer and soy milk and mix until it is a consistent dough. 6. Line a baking sheet with parchment paper and roll the dough into small balls that are slightly flattened (they will not spread much during cooking). 7. Sprinkle cookies with turbinado sugar and gently press in a few dried lavender buds on top for garnish. Bake in a preheated oven at 350 degrees for 10-12 minutes. Bake until very lightly golden; do not allow to brown (unlike conventional sugar cookies they will not be as golden due to no eggs, for more yellow color add a pinch of turmeric to the dough). Remove from the oven and cool on a wire rack. Enjoy! What else can you do with your lavender? Add a pinch of dried buds or a drop of essential oil to a shaker of turbinado sugar for a lavender-licous addition to any fruit salad, tea, or coffee. Try adding a drop of the essential oil to a batch of vegan chocolate ganache (8oz vegan dark chocolate whisked into 1/4 cup boiling soy milk) for a decadent truffle rolled in cocoa powder or use as is as a frosting. Lavender is wonderful for you inside and out! It will make your taste buds smile just as much as it will relax your body and balance your mind. I highly recommend diffusing lavender in your house to help you sleep peacefully or calm your thoughts - just add a few drops of essential oil to a pot of steaming water or to your oil diffuser. Another great use for lavender essential oil is as a relaxing fabric scent. Add a few drops to your unscented laundry detergent to transform your chores into a time to relax. Try diluting the essential oil in any veggie based oil or getting my lavender body oil and put a drop on your pulse points for relaxation during a particularly difficult time (if you are anticipating a test or work evaluation). Add some essential oil to distilled water in a clean spray bottle for a relaxing sheet spray or facial mist. Did you find any of this useful? How do you use lavender? I would really love to hear what you think! Thanks, I hope this will give you a few ideas of how to incorporate this wonderful little flower into your daily life for a sweet treat or body treatment. 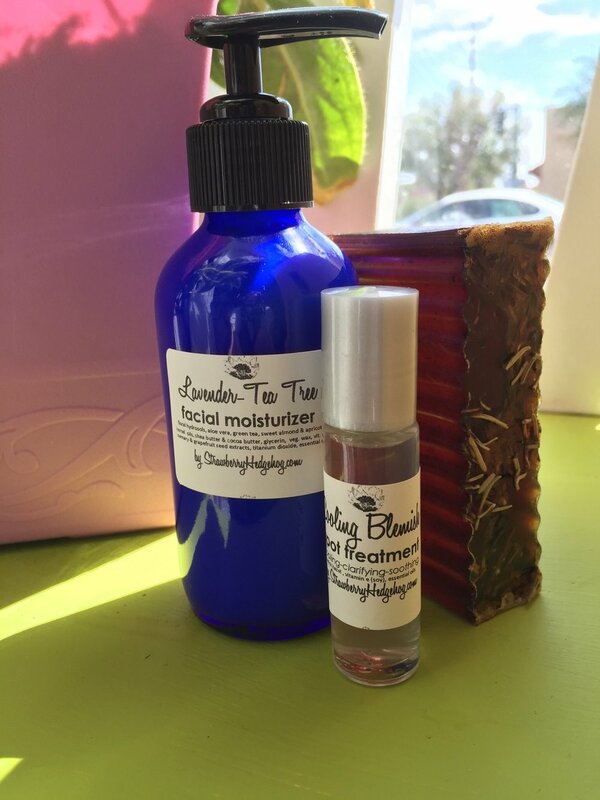 If you are interested in lavender body products, I use only 100% pure essential oil for the most aromatherapeutic bang for your buck and the most pleasant natural scent. Please check them out and let me know what you think. Thanks! Have a beautiful week. More next week..
Want to try our Lavender-Love Soap Set? >> Check it out!